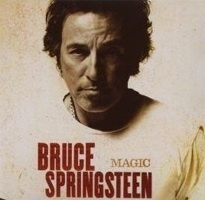 Tonight is the first night of Bruce Springsteen and the E Street Band’s tour supporting their new album “Magic“. I was fortunate enough to find the album, in it’s entirety, on AOL Radio yesterday – so I was able to listen to it a few times before I got my iTunes pre-release version. The album is pretty cool – I’m not the biggest Springsteen fan, but I do enjoy his music. Last time I saw him was in Hartford in 1984 (or was it ’85?). So, I’m due for a Springsteen concert. I wonder if there’ll be a big different from the 36 year old Springsteen to the 58 year old Springsteen? All I can remember from that show (I went both nights) was that hey played for more than 4 hours, Clarence Clemons played a note that seemed to last for a good 5 minutes, and he had a giant bowl of water he kept dunking his head into ever other song to keep himself cool… well, that and his band was INCREDIBLE. What would be really cool is if Little Steven would come out dressed as Silvio Dante! He won’t but it would be funny as hell. I loved his character on the Sopranos. Magic is a really good album, I’m enjoying it a lot! So far, I’m really digging: “You’ll Be Comin’ Down”, “Livin’ In The Future”, “Your Own Worst Enemy” and “Devil’s Arcade” are my favorites, but I really do like them all.